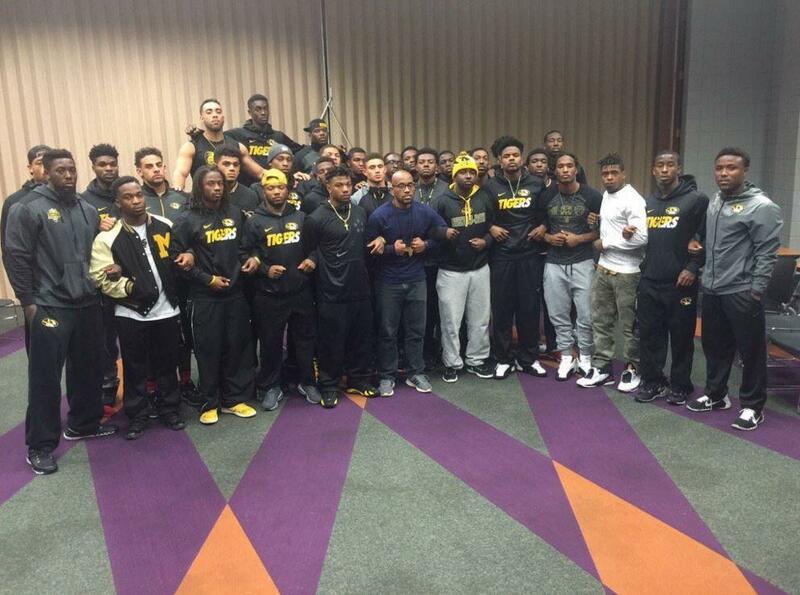 The Legion of Black Collegians posted a picture of the protesting University of Missouri football players. LBC captioned the picture “We are no longer taking it. It’s time to fight. #ConcernedStudent1950 #MizzouHungerStrike.” LBC is a group created to “develop a lasting appreciation of social, moral, intellectual, and most of all, cultural values” and raise cultural consciousness on the University of Missouri campus. The group was targeted on campus with racial slurs. During a rehearsal for their play, the group was interrupted by other students yelling racist insults at them. College athletes may be on the verge of winning much more than just games. But if they lose, everybody loses. At the University of Missouri, football players refused to play if the administration did not improve the way it was handling racial tensions. The school’s administration agreed to meet the team’s demands, and System President Tim Wolfe stepped down. Prior to the football players intervening, students were already protesting the school’s lack of response to racism on campus. Student group Concerned Student 1950 – referencing the first year black students were allowed to attend the school – released a list of demands, including that Wolfe acknowledge his mishandling of the racial problems the university was facing and step down. A graduate student at the school, Jonathan Butler, went on a hunger strike until the school made changes. The day after the football player’s refusal to play, Wolfe released a statement saying the school would launch an investigation into the racism on campus. The next day Wolfe resigned. The Division I program revenue brings in thousands of dollars to the school. In 2008, the team earned more than $55 million for the University. Before the football team threatened to stop playing, little was done to address the students’ concerns; afterwards, the administration agreed to achnowledge the issue. Football teams not only wield influence on a school’s administration, but also influence the school’s student body. “For many schools, [sports teams] contribute to the school spirit. So they can also contribute to these causes,” said field hockey and lacrosse senior, Bridget Mitchell. Mitchell will play lacrosse at the University of Colorado Boulder next year. Popular teams can easily reach out to students and use their fame to advocate for change among students and fans outside of the school. College football drew in as many as 33.4 million viewers in 2014, according to the National Football Federation – the largest audience in cable history. The Missouri team’s achievements raises the question: should football players be expected to use their influence to fight against racism? Should all college athletes? “When student athletes play, they are representing their school, and the school’s actions reflect upon them,” Mitchell said. However, refusing to play is risky. Athletes jeopardize scholarships. In some cases, those scholarships are their only means to attend the school they are playing for. Athletes attending college on scholarship are already under pressure to train and compete; adding other responsibilities is not on every athlete’s agenda. This is what makes what the Missouri football team’s actions so admirable: they risked scholarship and possibly education, as well as personal athletic goals and playing the sport they love, to stand up for a greater cause. Racism on college campuses is becoming more and more evident. From fraternities and sororities chanting racist slurs to college security targeting male African American students, the racism is evident. It is unacceptable that little is being done to put an end to it. Athletes, especially football players, hold financial power over universities and can reach out and unite other students. As Missouri’s team demonstrated, athletes have the power to affect change. “I feel like ending racism on campus is a bigger issue than having a scholarship revoked,” senior Justyn Moore said. Moore plans to run track and cross-country in college. More than 170,000 student-athletes compete in Division I NCAA sports each year. If most of these athletes stopped playing until colleges made efforts to end racism, colleges would have no choice. It is unlikely that, with a mass effort, all athletes would lose their scholarships and not be allowed to play. A major source of revenue would disappear, and finding a replacement for every athlete would put a large strain on universities. Not only would it be inconvenient for colleges, but the institutions would also no longer be able to deny that racism on campuses is a problem. Though athletes have the stature to advocate for change, the responsibility to strive for equality should not only fall to athletes, but to everyone. “I think not only athletes, but people in general, have an obligation to speak up,” said senior field hockey and lacrosse player Jessica Morford, who will play field hockey at Indiana University. Shaker has long prided itself on being a diverse, open-minded place. We are exposed to ethnicities and cultures different from our own, and given the opportunity to discuss racial issues through organizations such as the Student Group On Race Relations. This gives us the skills necessary to make changes on college campuses, to speak up when we see racism because we recognize it as wrong. Journalism I Reporter Claire Ockner contributed reporting.